March is National Frozen Food Month, in which we recognize and celebrate the innovation that has saved us from countless hours in the kitchen after a long day of work. Sure, it can be said that nothing beats a home cooked meal, but on those nights when you’re so tired you just want to plop down in front of the TV and “veg out”, it’s hard to argue that convenience can sometimes be the better option. 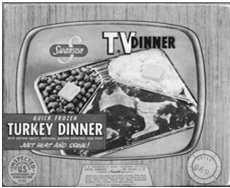 Below, you can see a picture of the first TV dinner, made by Swanson in 1954. This invention was so important to our nation’s history that an aluminum tray from one of these TV dinners can actually be found in the Smithsonian Museum. Even our culinary professionals, working hard in your chef coats to provide delicious, meals to your families and restaurant patrons, should appreciate these miraculous innovations. So, this month, take some extra time in the grocery store to peruse the frozen foods isle and remember the important role this product has had in this country – bringing families together in the early years of television.